Reactivity to unexpected situations is one of the most important characteristics of walking for real world applications. In this study, we introduce a reactive biped robot walking method that reflects only the current state of the robot. Therefore, time plan and trajectory tracking control are not required for robot walking, and this enables reactive behavior to unexpected contact or disturbance. The walking algorithm is realized through a whole-body control algorithm based on the operational space control framework, that possesses the capability to command the required force for tasks and also implement compliant task behavior by adjusting corresponding task gains. 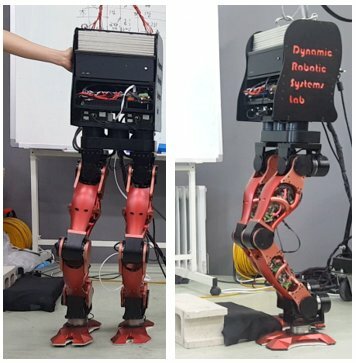 The performance of the proposed method is verified by experiments with a 12-DoF torque controlled biped robot. Robust walking is demonstrated when the foot is stopped by an unexpected obstacle or when the lateral motion is unexpectedly blocked and released by a human. We propose reactive walking method that reflects only current state of the robot. Desired CoP and walking phase are determined by the capture point and the state of the CoM. Trajectory tracking control of the CoM is not required because the method does not consider any time plan. The compliant characteristics of the torque controlled robot enables robust walking even if external disturbance occurs.